Catholic pilgrims gathered in Federal Plaza downtown Saturday celebrating the 10th anniversary of the church's campaign to reform immigration in the United States. 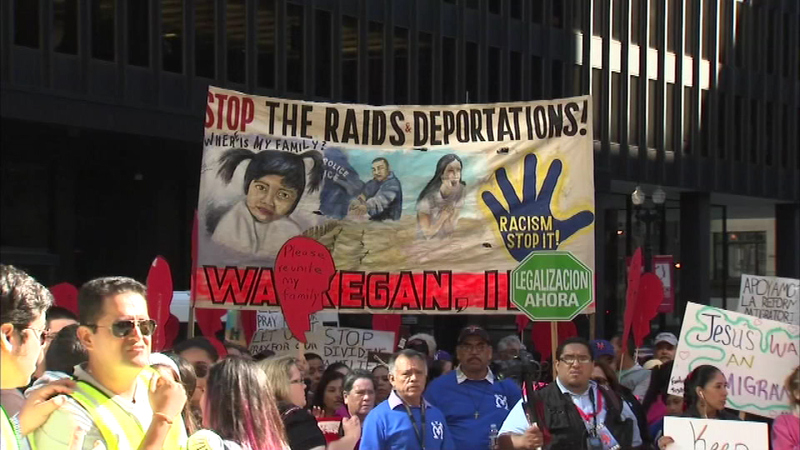 CHICAGO (WLS) -- Catholic pilgrims gathered in Federal Plaza downtown Saturday celebrating the 10th anniversary of the church's campaign to reform immigration in the United States. Groups came from three different churches and then took part in a prayer vigil. The Chicago archdiocese sponsored the event. "We are not alone," said Elena Segura, Chicago Archdiocese Immigrant Affairs. "Pope Francis is with us. Archbishop Cupich is with us. We have companions on the journey." Many spoke out against the policies which they say break up immigrant families.